Evolution Fitness congratulates their 2013 Rock My Jeans / Cut My Gut challengers on their great success! The Rock My Jeans / Cut My Gut Challenge was an 8 week challenge, with the goal being to lose 2 jeans sizes by the end. The participants were advised to workout 4 times per week at Evolution Fitness, either in one of the group coaching classes or working their own individualized exercise program. They were also given nutrition guidance, along with a nutrition journal to help them track what they were eating. The coaches and staff at Evolution Fitness checked everyone’s journal on a weekly basis to help the challengers stay compliant with their nutrition and to make tweaks and adjustments as necessary. All the Rock My Jeans / Cut My Gut challengers tried on their dream jeans just before the challenge began, as well as throughout the challenge to track progress. The jeans were kept on site at Evolution Fitness for the entire length of the challenge. At the first try-on, most of the participants couldn’t even zip their jeans up, but by the end, nearly everyone fit comfortably into their jeans and were able to ‘rock them’ on the night of the celebration party at Evolution Fitness. The coaches and staff are so proud of all the challengers for all of their hard work and dedication. “If you trust the process and commit to it, you will succeed,” said David Duzenski, co-owner of Evolution Fitness. “We had so many challengers who were surprised that it actually worked but we believed in them the whole time. We could tell by their commitment that they would be a success,” added Danielle Kane, fellow co-owner. 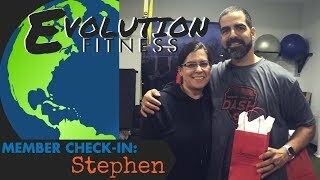 Evolution Fitness plans to run the challenge again next year. It will begin sometime in late September or early October of 2014. In the meantime, they will soon be holding their New Year, New You challenge for the second year. This is a 6-week challenge that focuses on burning and losing fat, utilizing their state of the art body composition analyzer, the InBody 520, to track the participant’s progress. And this year, Evolution Fitness is taking the challenge to a whole new level by offering a $2,000 cash prize to the winning team! For more details, please call 856-751-1300.